Green Chimneys School at Clearpool Campus follows the academic curriculum standards designated for Intermediate School programs. All students in grades participate in New York State Standardized Testing. High school students receive instruction to fully prepare them for New York State Regents examinations or Regents Competency Tests (RCT) as determined by the Committee on Special Education. Classrooms are equipped with current technology including SMART Boards and students have regular access to computers to benefit from educational online resources. The Intermediate School uses the Readers Journey series, a novel-based Language Arts program dedicated to turning students into lifelong readers. The curriculum focuses on reading, grammar, vocabulary and communication skills. Students learn and practice how to read, write, listen, and speak for information and understanding, literary response and expression, critical analysis and evaluation, and social interaction. Curious middle school students select from a wide range of experiments and discovery projects for the annual Clearpool Science Fair held each January. Green Chimneys School at Clearpool Campus follows the academic curriculum standards designated for Intermediate School programs. Using our environmentally-rich campus environment, students investigate all living things, both plant and animal, as they become familiar with the Scientific Method. Curriculum encourages students to explore the physical sciences by discovering the characteristics, properties and chemical composition of all forms of matter. Students explore the characteristics of the plant and animal kingdom in greater depth through a focus on the living environment and are introduced to the microscopic world. Students explore the great diversity of organisms that share the planet, study the method by which energy is transferred from the sun to all known life forms, and learn about replication of these forms through the duplication, growth and reproduction of DNA. Teachers in all grades incorporate age-appropriate lab experiments into their class curriculum. Students learn about the different cultures of the U.S., Canada and Latin America as they compare and contrast the cultures of the Western Hemisphere and focus on the geographic, economic, social/cultural and political understanding of these countries. Global understanding continues as students learn about the geography and economic interdependence of all people living in the Eastern Hemisphere and develop an understanding about the social/cultural, political, and historical aspects of life in that area of the world. Students study chronologically the global heritage of our nation’s people as it was prior to 1500 through the Civil War and Reconstruction periods, incorporating NY state history along with the history of the existing U.S. states and territories of the time. Students continue their chronological study of the U.S. and New York State history from the industrial, post-Civil War era through the changing nature of the American people from World War II to present. Llamas, like Alexa and Summer Wind, are very social animals and live with other llamas as a herd. They are intelligent, inquisitive, and can learn simple tasks after just a few repetitions. 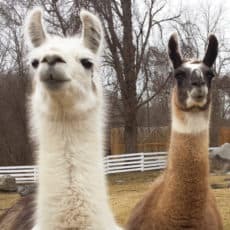 The wool produced by a llama is very soft, versatile, and lanolin-free and, each Spring, Green Chimneys students help sheer our llamas and the wool is made into yarn which is for sale at our country store! Llamas eat grass, hay, corn silage, alfalfa, and grass roots, and adults can drink 3 gallons of water a day.